Last week the President of the United States, Barack Obama, officially designated three new national monuments in the California desert: Mojave Trails, Sand to Snow, and Castle Mountains. 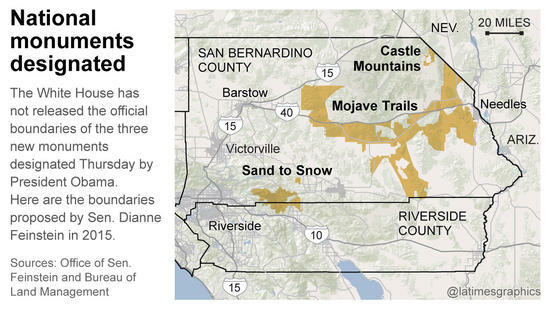 The designation of 1.8 million acres of land is the result of ongoing efforts by California senator Dianne Feinstein. This entry was posted in California Desert and tagged Antiquities Act, Barack Obama, deserts, Diane Feinstein, national monuments on February 14, 2016 by admin.